It may surprise you to learn that choosing a jewellery present for your mother can be one of the less stressful days of the year. This is because most children know what their mother's preferences are when it comes to jewellery. All it takes is a little mental prompting. Ask yourself: Does she show special fondness for necklaces? Is she always wearing what seems like an entire collection of bracelets on her wrists? Is she given to sporting big "statement" rings every chance she gets? These are the kinds of questions that help refine a search for what to buy, and a few moments reflection or a short conversation with siblings will bring forth quick responses that will guide you. If your mother is partial to necklaces, then the question is how much necklace to get her. If she is clearly fond of bracelets or statement rings or animal pins, then the course is clear. Another point that makes this day easier than others is that mothers just love everything their children give them. That makes it hard to go wrong if you put in even the minimal amount of consideration into your choice. Whether it's a pendant, a ring, a brooch or earrings, your gift will be the perfect one for your mother. For those with extended families, remembering grandmother on this special day is an opportunity to bring a sense of elation to someone important. This is especially true if grandmother doesn't usually get a present on mother's day. One choice that is favored by many is the mothers bracelet which is equally appropriate -- if not more so -- for grandmothers. 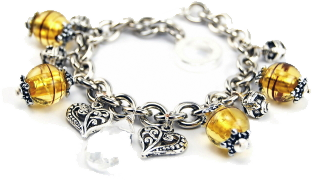 With this bracelet, the wearer has a charm for each of her children or grandchildren. Often, the charms are completely different to symbolize the unique character of each individual child.